What is infrared radiation (heat radiation)? 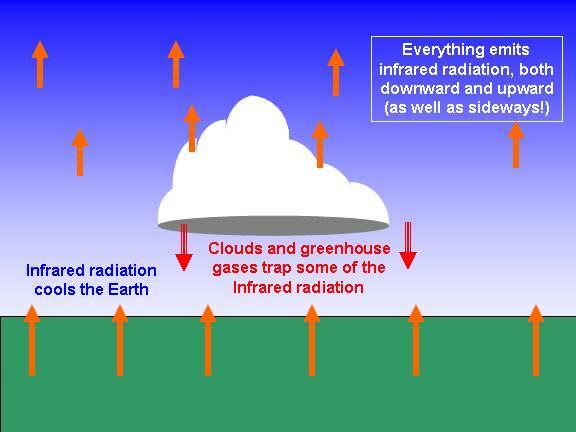 Infrared (IR) radiation is just as important to the Earth's weather and climate as sunlight is. This is because, for all of the sunlight that the Earth absorbs, an equal amount of IR radiation must travel from the Earth back to outer space. If this was not the case, there would be global warming or global cooling. Thus, just as the temperature of a pot of water on the stove is tied to any imbalance between the rate at which the pot receives energy from the stove versus the rate at which the pot loses energy to its surroundings, global warming or global cooling is caused by an imbalance between absorbed sunlight and emitted infrared radiation. Everything emits infrared radiation, although some solid materials are not totally efficient emitters (their infrared emissivity is less than 1.0) and most gases are mostly transparent to infrared radiation. But even though everything emits IR energy, we usually do not notice it because it is often weak, and we can't see infrared light like you can sunlight. It takes a very hot object for us to feel IR energy, such as a hot stove, a fire, or a brick wall heated by the sun. Greenhouse gases in the atmosphere, especially water vapor, "trap" (absorb and emit) some of this infrared radiation, and keep the earth habitably warm. Clouds also produce their own greenhouse effect. The reason why the air cools so quickly on a clear, dry evening is because the lack of humidity and clouds allows large amounts of IR radiation to escape rapidly to outer space as it is emitted upward by the ground and other surfaces. FEELING INFRARED RADIATION FROM THE GROUND Here's an easy experiment you can try which requires no equipment. On a clear dry evening after a sunny day, as the sun is setting, extend your arm out over the ground -- grass, dirt, or even better a driveway or parking lot. Then, turn your hand over, back and forth, several times -- palm facing down, then up, then down, etc. You will notice that the ground-facing side of your hand feels slightly warmer than the sky-facing side. The reason for this is that greenhouse gases in the colder atmosphere above you are emitting less infrared radiation downward than the warmer ground is emitting upward. This is one way to better appreciate the fact that the Earth is continuously losing IR energy to outer space.